Motivated by our previous findings, we performed some more tests on service IOBluetoothHCIController of the latest version of Mac OS X (Yosemite 10.10.1), and we found five additional security issues. The issues have been reported to Apple Security and, since the deadline we agreed upon with them expired, we now disclose details & PoCs for four of them (the last one was notified few days later and is still under investigation by Apple). All the issues are in class IOBluetoothHCIController, implemented in the IOBluetoothFamily kext (md5 e4123caff1b90b81d52d43f9c47fec8f). 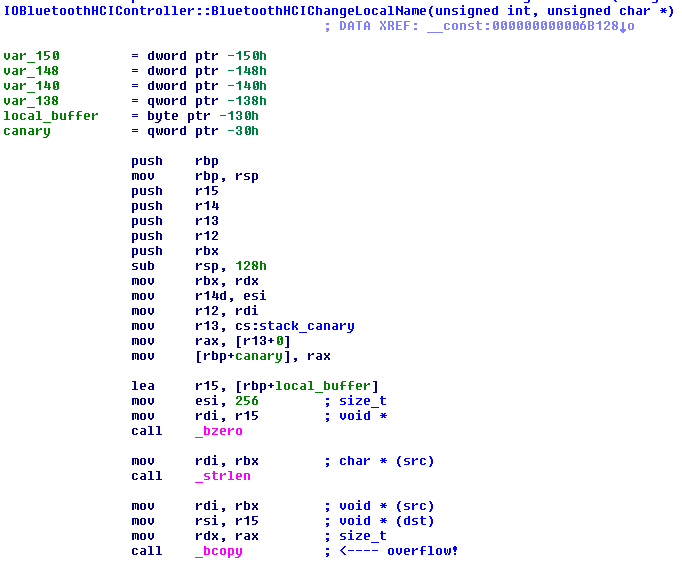 Many callback routines handled by IOBluetoothHCIController blindly dereference pointer arguments without checking them. The caller of these callbacks, IOBluetoothHCIUserClient::SimpleDispatchWL(), may actually pass NULL pointers, that are eventually dereferenced. More precisely, every user-space argument handled by SimpleDispatchWL() consists of a value and a size field (see crash-issue1.c for details). When a user-space client provides an argument with a NULL value but a large size, a subsequent call to IOMalloc(size) fails, returning a NULL pointer that is eventually passed to callees, causing the NULL pointer dereference. Trying the same without the -m32 flag results in the 64-bit Mach-O being blocked at load time by the OS with message "Cannot enforce a hard page-zero for ./zeropage" (unless you do it as "root", but then what’s the point?). As shown in the screenshot below, IOBluetoothHCIController::BluetoothHCIChangeLocalName() is affected by an "old-school" stack-based buffer overflow, due to a bcopy(src, dest, strlen(src)) call where src is fully controlled by the attacker. To the best of our knowledge, this bug cannot be directly exploited due to the existing stack canary protection. However, it may still be useful to mount a LPE attack if used in conjunction with a memory leak vulnerability, leveraged to disclose the canary value. IOBluetoothHCIController::TransferACLPacketToHW() receives as an input parameter a pointer to an IOMemoryDescriptor object. 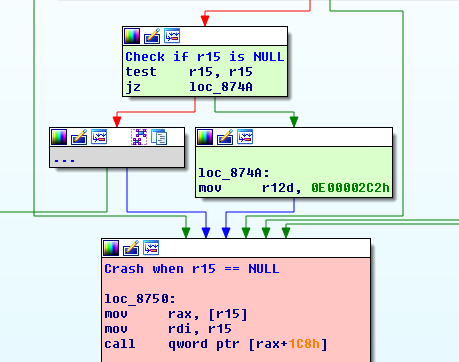 The function carefully checks that the supplied pointer is non-NULL; however, regardless of the outcome of this test, it then dereferences the pointer (see the figure below, the attacker-controlled input parameter is stored in register r15). The IOMemoryDescriptor object is created by the caller (DispatchHCISendRawACLData()) using the IOMemoryDescriptor::withAddress() constructor. As this constructor is provided with a user-controlled value, it may fail and return a NULL pointer. See Issue 1 discussion regarding the exploitability of NULL pointer dereferences on Yosemite. The passed format string "HbbNN" will eventually cause size_of_addresses bytes to be copied from p_device_addresses to the HCI request object identified by req_index in reverse order (the 'N' format consumes two arguments, the first is a size, the second a pointer to read from). If the calculated size_of_addresses is big enough (i.e., if we provide a big enough num_of_keys parameter), the copy overflows the buffer of the request, thrashing everything above it, including a number of function pointers in the vtable of the request object. These pointers are overwritten with attacker-controlled data (i.e., those pointed by p_bluetooth_keys) and called before returning to userspace, thus we can divert the execution wherever we want. As a PoC, lpe-issue1.c exploits this bug and attempts to call a function located at the attacker-controller address 0x4141414142424242. Please note that the attached PoC requires some more tuning before it can cleanly return to user-space, since more than one vtable pointer is corrupted during the overflow and needs to be fixed with valid pointers. All the PoCs we provide in this post are not "weaponized", i.e., they do not contain a real payload, nor they attempt to bypass existing security features of Yosemite (e.g., kASLR and SMEP). If you’re interested in bypass techniques (as you probably are, if you made it here), Ian Beer of Google Project Zero covered pretty much all of it in a very thorough blog post. In this case, he used a leak in the IOKit registry to calculate kslide and defeat kASLR, while he used an in-kernel ROP-chain to bypass SMEP. More recently, @i0n1c posted here about how kASLR is fundamentally broken on Mac OS X at the moment. Along the last issue identified, we shared with Apple our conclusions on this kext: according to the issues we identified, we speculate there are many other crashes and LPE vulnerabilities in it. Ours, however, is just a best-effort analysis done in our spare time, and given the very small effort that took us to identify the vulnerabilities, we would suggest a serious security evaluation of the whole kext code. 02/11: Notification of issues 1, 2 and 3. 23/11: No answer received from Apple, notification of issue 4. As no answer was received since the first contact, propose December 2 as possible disclosure date. 25/11: Apple answers requesting more time. We propose to move the disclosure date to January 12. 27/11: Apple accepts the new deadline. 05/12: Contact Apple asking for the status of the vulnerabilities. 06/12: Apple says they're still "investigating the issue". 23/12: Notification of a new issue (#5), proposing January 23 as a tentative disclosure date. 06/01: Apple asks for more time for issue #5. We propose to move the disclosure date to February 23. We remind our intention to disclose the 4 previous issues on January 12. 12/01: No answer from Apple, disclosing first 4 issues. 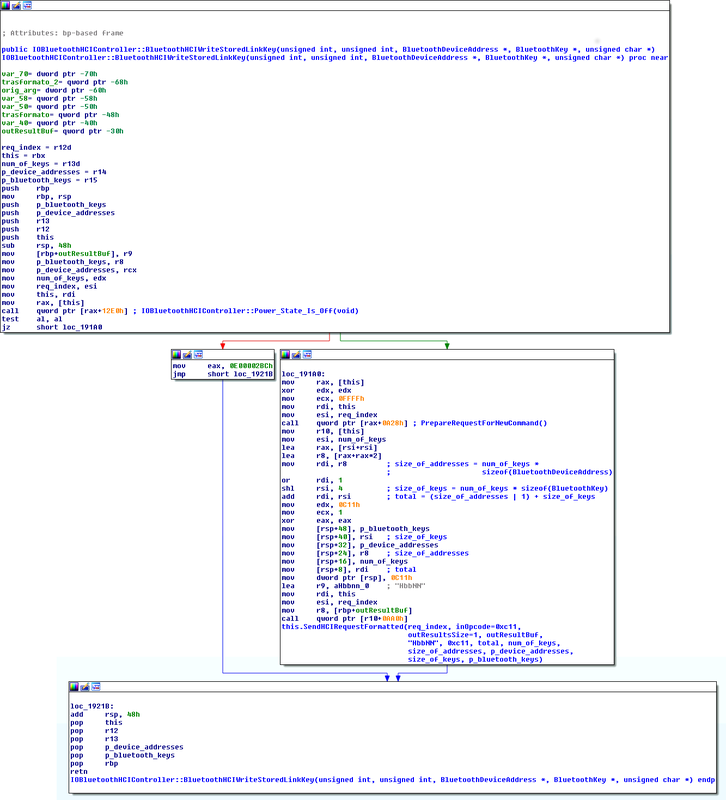 27/01: Apple assigned our issues CVE-2014-8837 and patched all of them in Mac OS X 10.10.2.